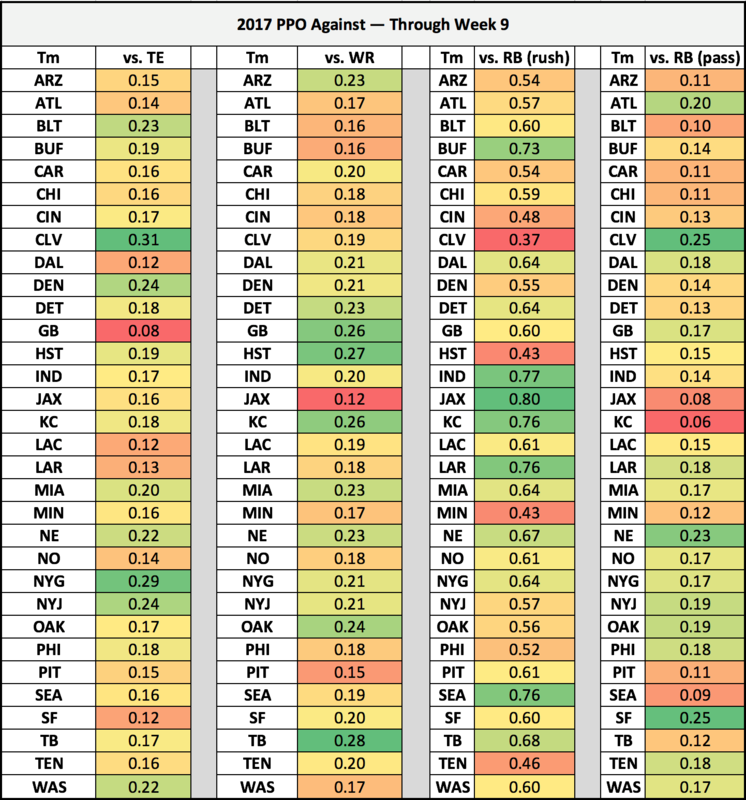 Fantasy points per opportunity continue to be a fantastic way to identify players who are in potential breakout spots based on matchup and their own fantasy efficiency. And even though Week 10 looks pretty thin across the board — e.g. there aren’t a ton of fantastic options at first glance — our PPO data still highlights some of this week’s potential stars. I like Melvin Gordon as a sneaky option this week against a look-tough matchup against the Jaguars that really isn’t as bad as it seems on the ground. In fact, Jacksonville has given up the most fantasy PPO to opposing running backs on the ground this year. Gordon has also been removed from the injury report and is coming off a bye. Alvin Kamara will keep his breakout streak alive against the Bills in Week 10. Buffalo has given up the sixth-most fantasy PPO to opposing backs on the ground, and while Kamara isn’t a workhorse on he ground, he should see about 10 touches (and he’s averaging 6.0 YPC). Kamara ranks fourth among all running backs in individual PPO this year. You have to like Matt Forte against the Buccaneers this week. Tampa Bay has ceded the seventh-most fantasy PPO to running backs on the ground this year, and Forte is coming off a season-high 14-attempt effort. Forte ranks 13th among all running backs with 50-plus rushing attempts so far this year in individual PPO. Theo Riddick typically sees a healthy 4-6 targets per game, and while he only plays about 40 percent of Detroit’s offensive snaps, he could find huge success through the air against the Browns, who have given up the most fantasy PPO to opposing backfields through the air so far this year. Riddick’s 0.42 PPO in PPR leagues is not earth-shattering, but it is tied with studs like Ezekiel Elliott and Jordan Howard. Am I allowed to call Antonio Brown a breakout candidate? You’re obviously already starting him, but this is a complete blowup spot. He ranks tied for first among all receivers who have seen more than 10 targets in individual PPO, and the Colts are a bottom-half team in terms of PPO given up to opposing receivers. The Texans have given up the second-most PPO to opposing wideouts this year, and this sets up as a nice spot for Cooper Kupp. His teammates went bonkers last week, but Week 10 should be Kupp’s time to shine. Kupp ranks tied for 23rd (with Dez Bryant, Mohamed Sanu, and Adam Thielen) in terms of PPO scored among wideouts. Demaryius Thomas saw a season-high eight receptions (on 12 targets) in Week 9 with Brock Osweiler back under center, and he should be heavily utilized again in Week 10 against the Patriots, who have given up the ninth-most fantasy PPO to opposing receivers on the year. It might not be pretty the whole time, but Thomas is primed for a good game on Sunday night. Mohamed Sanu should have a huge game is Julio Jones is forced to sit against the Cowboys in Week 10. Dallas is a bottom-half team in terms of PPO given up to enemy receivers this year, while Sanu has been efficient in his own right (tied for 23rd in individual PPO). Rob Gronkowski should have a monster game on Sunday night against the Broncos, who have given up the fourth-most PPO to the position on the year. Gronkowski is third among all tight ends who have at least 35 targets in terms of PPO. Even without his starting quarterback, Cameron Brate is in a good spot against the Jets, who have given up the third-most PPO to tight ends this year. Brate’s 0.46 PPO are just off of Gronkowski 0.47 figure. After scoring in four straight games from Weeks 3-6, Brate is touchdown-less in his past three. Look for that to change in Week 10. If Eric Ebron is going to have another good game this year, it will have to come in Week 10 against the Browns. He’s seen two of his three highest yardage totals over the past two weeks, and while he’s essentially in a tight-end-by-committee in Detroit, the matchup doesn’t get any better, as the Browns have given up the most PPO to opposing tight ends this year.